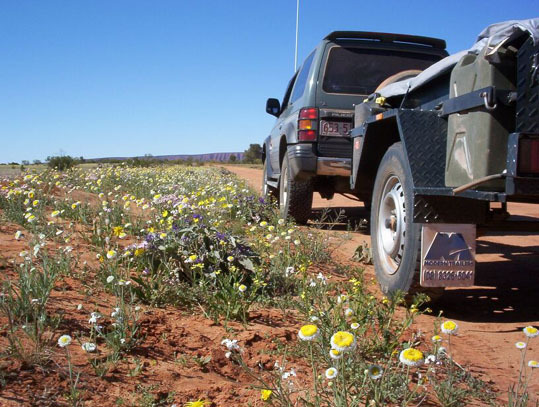 We left from Alice Springs for the Old Andado Track, heading south on the Stuart Highway. Turning off just south of Stuart’s Well to take the Hugh Stock Route. This road heads almost due east transecting the Old Ghan route. From there we navigated through station country, heading north east until we picked up the Old Andado Track. A right turn and onto the Old Andado Homestead, finally travelling west to Kulgera, and coming back out on the Stuart Highway. Don’t try replicating this back road connection to the Old Andado Track unless you are an experienced navigator! My father towed his older style pop-top which took a little bit of a battering on the corrugated sections. However, we traveled slowly on the rougher sections to make it through without any major dramas. As a note of caution, and even though the Old Andado track doesn’t look far on maps, you need to allow a couple of days. You will need to be self sufficient and prepared for anything to occur. 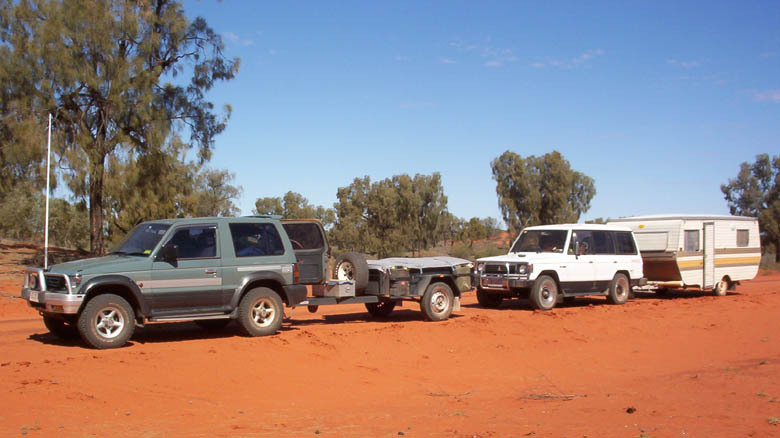 This is a very remote part of the country so vehicles must be well equipped for emergency situations. Take sufficient fuel, food and water, and communications as there is no-where to stop and get supplies. The sand dunes of the Simpson Desert are parallel, running south-east to north-west. They are about 20 metres in height, and spaced around 700 meters apart. The trip down the Old Andado track is pretty straightforward as you mostly travel between the dunes, and unlike an east-west trip you only need to cross a few dunes. The dunes are formed from very fine sand which is easily transported by the wind. Sandhills near watercourses are usually yellowish white from the alluvial soil, while red sandhills are tinted by a coating of ferric (iron) oxide on the sand grains. 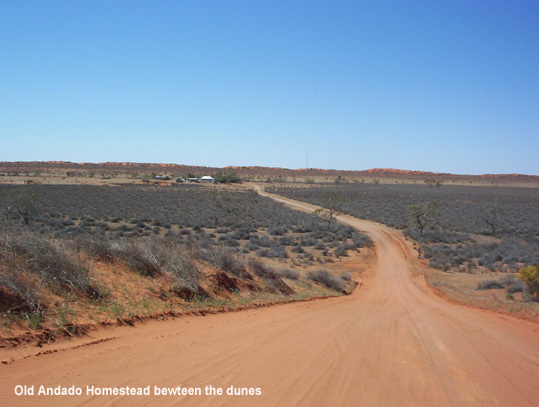 The Old Andado Homestead is about 20 kilometres into the Simpson Desert and was built in the mid 1920’s by the McDill Brothers, Robert and George. The brothers built the original two room section adding to an earlier mud brick when George was married. The iron and other materials used to build the house were carried to Andado by camel teams from Oodnadatta. Andado has changed hands a number of times and in 1955 Mr H Overton, a part owner of Clifton Hills station formed a partnership with Mac Clark. They formed the Andado Pastoral Company. In 1958, the first of several new residences built 16kms west of Old Andado forming the new and now Andado Station. Members of the Clark family remained in the old homestead and in 1969 the Clark family acquired the station outright, securing Freehold Lease no 778. Mr Mac Clark died in 1979 and Molly stayed on to manage the property. Mac and Molly Clarke were the pioneers of Old Andado Station and Molly also passed away in late 2012. In 2013 the Old Andado Charitable Trust was formed to help maintain and restore this special piece of Australian history. We took the Old Andado track and visited the homestead in 2004 with my elderly parents. It reminded us of our own humble homestead at Yamarna in WA many years ago. The nearby Mac Clark Conservation Reserve, is home to one of three known stands of Acacia Peuce or waddy-wood. 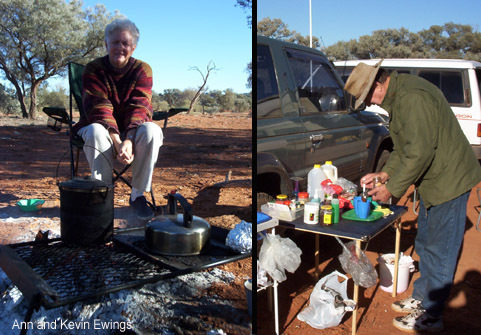 The Reserve is named after the old pastoralist, Mac Clark. Acacia peuce, or waddywood is one of the rarest and most striking trees of the Australian arid zone. It grows in this Reserve on a stony wind-swept plain in one of the driest places in Australia. The average annual rainfall is only 150mm. Daily maximum temperatures average almost 40 degrees Celsius in January. In such a harsh environment, only a few shrubs and grasses manage to survive. The Acacia peuce thrives, growing to heights of 17 metres and it is estimated it can live for up to 500 years. 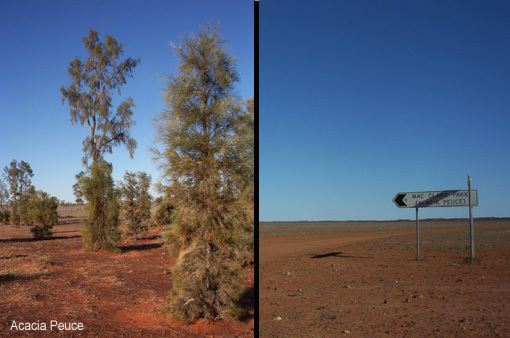 Acacia peuce is found in three places, near Boulia and Birdsville in Queensland and 40km north of Old Andado Homestead in the Mac Clark Conservation Reserve. In the first half of this century many of the trees were cut down to build stockyards and shelters. This was despite the wood being so hard it won’t easily take nails. 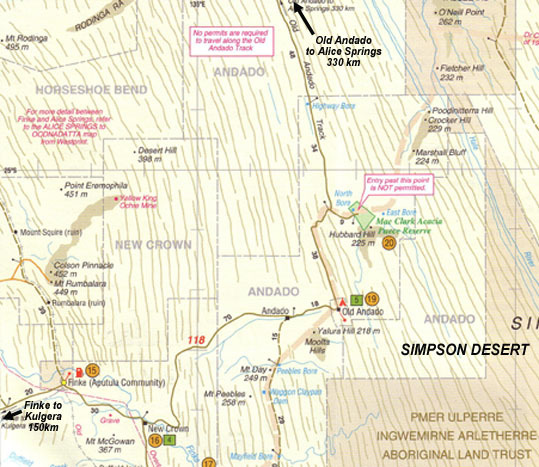 Andado is the largest station bordering the Simpson Desert and is located further into the desert than any other property. 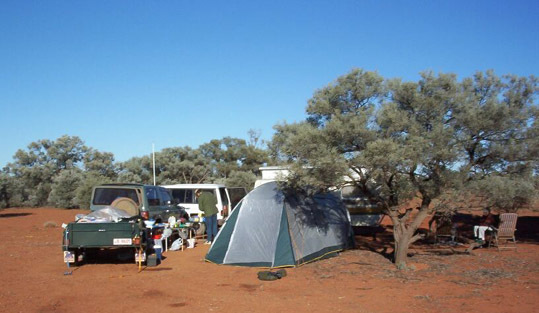 Andado, is 10,859 square kilometres and is the third largest single station in the Northern territory (about 2,000 square kilometres smaller than Wave Hill and Brunette Downs). The old Andado Track experience was fantastic and some day I would love to venture there again.